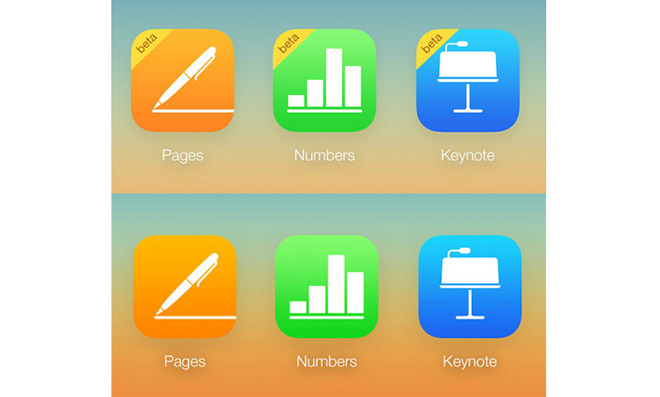 Prior to the change, each iWork app as displayed on iCloud.com appeared with a yellow "beta" tag on its icon to signify that the product was still in testing. Following today's iWork update, the tags no longer appear on the iCloud landing page or the iWork for iCloud informational webpage. In addition to the aforementioned mobile preview capability, iWork for iCloud also comes with a commenting interface, document change tracking, version history, word count (for Pages) and support for ten additional languages. On the Web, users can work with Pages '08 and '06 documents, or Numbers '08 spreadsheets. The last significant change to iWork for iCloud came in February when Apple made the Web-based productivity suite available to all comers, even users without iOS or Mac devices, by opening Apple ID account registrations. Previously, Apple ID logins were limited to owners of Apple hardware.